Cooling radiator POLINI 20x13x14cm veiled universal, a little larger than the other models. 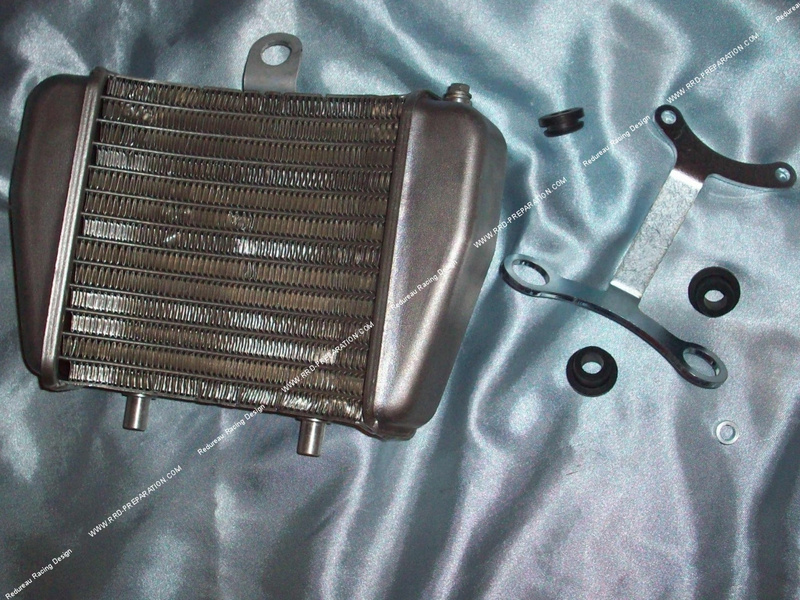 This radiator was used in GP3 to cool the larger well-equipped engine. 150,73 € 150.73 tax incl. The radiator GP3 is a competition radiator from polini normally intended for mini GP3 competition motorcycles new models! However, we use them for the universal because it is very practical and very powerful. It comes with its aluminum brackets and silentblocs anti-vibration rubber. The radiator is made of aluminum (alloy) very high-end for a good diffusion and extraction of heat. It has a bleed screw, 2 inlets / outlets of coolant of Ø 9mm inside and 14mm outside so provided for an internal diameter of hose of 13 to 15mm. We highly appreciated its veiled form that allows it to land wherever you want. Its 32mm thickness in combination with its good fin architecture and volume will allow it to cool even on the most advanced engines. This is a great discovery for us for the various prototypes on scooters, mobs or 50cc box. Fixation brackets in aluminum (thus modelable) on silentbloc rubber 3 in number including a welded tab on the upper part of the radiator and two on the lower part not mandatory.